If I'm being honest, I don't usually like wreaths. I can't really put my finger on what it is, but I just don't. But the other day, we were at Kroger and they had SO much greenery and baby's breath for $.65 each and for some reason I just wanted to buy all of it. And so, I did. I had no idea what I was going to do with it and was considering making some sort of garland as a Christmas decoration. In the end, making a wreath seemed to make the most sense and it looks pretty nice on our front door. And repeat. I mixed in one baby's breath bundle after every two green bundles. But the pattern isn't that serious. Do whatever you want, it's your wreath! You could add anything you wanted to this wreath with the same method. I am considering adding some lights to the wreath, but other than that, I like how simple it is. And I feel like you could spray water on the back of the wreath to try to extend the life of the wreath, but these stems really don't change much when they die. I guess it all just depends on what you use. 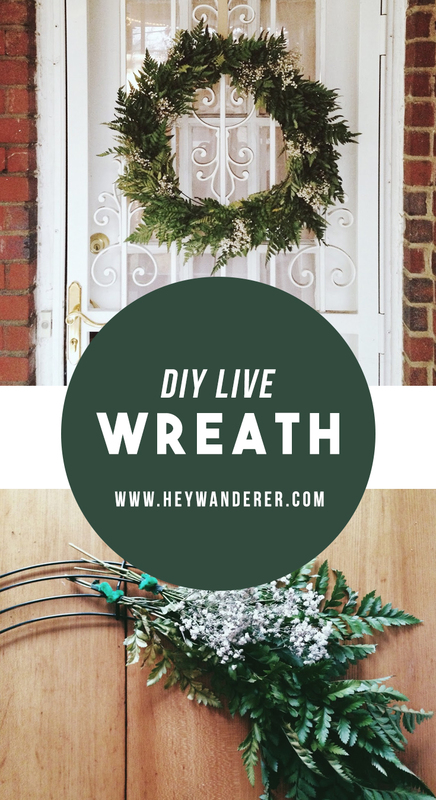 I don't consider myself a converted wreath-lover, but I definitely think I see more live wreaths in my future. Pin this DIY for later! Very pretty. I like the Baby's Breath.